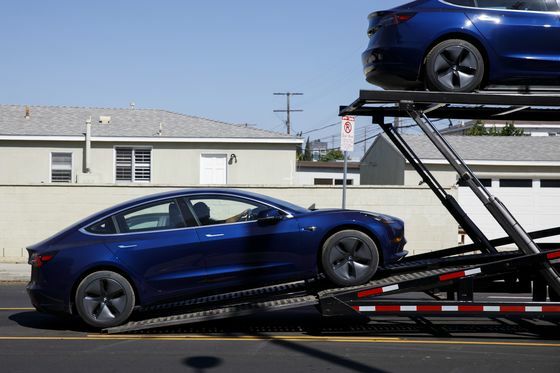 (Bloomberg) -- Tesla Inc. is making it more difficult to buy the $35,000 version of the Model 3 sedan that used to be viewed as pivotal to its growth. The electric-car maker announced another series of changes to its lineup and pricing late Thursday to “simplify vehicle choices.” All Tesla vehicles that can be ordered online now come with the driver-assistance system Autopilot standard, the company said in a blog post. The Model 3 with Standard Plus now costs $39,500 with Autopilot included. But along with those adjustments, Tesla is de-emphasizing the $35,000 price point promised when it first unveiled the sedan in March 2016. Deliveries of the entry-level models start this weekend -- more than six weeks after the company starting taking orders. Customers who want this version from now on won’t be able to get it from Tesla’s online ordering menu. They’ll have to call or visit a store instead, and the car won’t come with Autopilot. Tesla shares were little changed as of 2:30 p.m. Friday in New York. The stock is down about 19 percent this year. Tesla is also offering a Model 3 lease in the U.S. for the first time, though with a big caveat. Customers won’t have the option to buy the car at the end of the lease because the company plans to use the vehicles in a forthcoming Tesla ride-hailing network, according to the blog post. On its ordering website, Tesla’s default options are for customers to make a $3,000 down payment and spend a total of $4,199 at signing of a three-year, 10,000-mile annual lease. The monthly payment due on that basis is $504. Chief Executive Officer Elon Musk first talked about his vision of a Tesla shared-vehicle fleet when he unveiled his Master Plan Part Deux in July 2016. He’s started to talk about the network again as Uber Technologies Inc. follows Lyft Inc. in filing for an initial public offerings. Tesla also scheduled an event for Musk and other executives to tout Tesla’s self-driving technology on April 22. On Twitter, Musk recently confirmed that the purpose of the cameras built in above the rear-view mirror of the Model 3 is to record video when owners put their car on Tesla’s future network, which he said would compete with Uber and Lyft. Other criticism of Tesla and Musk surfaced Friday from more high-profile voices. In an interview with Yahoo Finance, billionaire Warren Buffett said Musk had “room for improvement” in behaving like a CEO. Hedge fund investor David Einhorn, who has been short Tesla stock for years, wrote in a letter to investors that “the wheels are falling off” the company.